Merton College has topped Oxford University's exams league table for the third time in as many years. It recorded 41 first-class and 40 upper second-class degrees this year, with just six students getting lower seconds and none getting thirds. In second place was St John's College, followed by St Catherine's. St Hilda's, Oxford's only all-female college, came last in the Norrington Table of exam results. Of its 101 finals candidates, just 12 got firsts. Merton was founded in 1264 by Walter de Merton, Lord Chancellor of England and Bishop of Rochester. 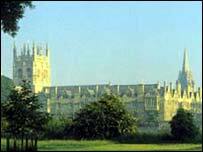 Its eminent former members include the poet TS Eliot and Lord of the Rings author JRR Tolkien. The Norrington Table, named after Sir Arthur Norrington, a former president of Trinity College, is not recognised by Oxford University. It is compiled each year for The Times newspaper by undergraduates who check results posted on university notice boards. It awards five points for each first-class degree, three for an upper-second, two for a lower-second and one for a third. Each college is graded according to the percentage of a possible maximum points score it achieves. By this scale, Merton gained 77.47%, St John's 73.73% and St Catherine's 73.39%. St Hilda's gained 62.18%. The results of some 3,000 students were analysed for the table.